Katherine Sherwood explores the evolution of medical imagery in her artwork. 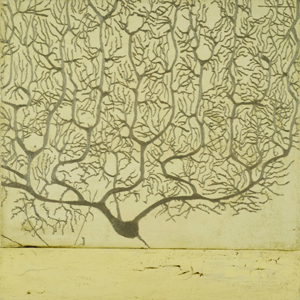 This painting is based on the early sketches of Italian physician and scientist Camillo Golgi, who, in 1873, developed a method of staining nerve tissue to make the complex structure of the brain visible. Known as “Golgi’s method,” it was later used by Spanish neuroanatomist Santiago Ramón y Cajal to reveal much about the organization of the nervous system. Katherine Sherwood is a professor at the School of Art Practice at the University of California in Berkeley. She exhibits her work regularly in California and often in New York. In 2000, her work was included in the Whitney Museum of American Arts’ Biennial Exhibition in New York City. Her exhibition, “Golgi’s Door,” was on view at the National Academy of Sciences from 2007 to 2008.